According to a report on Monday, Apple has switched to an expedited shipping service for returns coming back to the Online Apple Store, speeding up processing time and allowing customers to receive refunds in less than a week. In a study conducted by retail research firm StellaService, Apple now supplies customers with FedEx 2Day shipping labels when they return a product purchased through the company's online storefront, reports Reuters. The expedited service can get packages to Apple's warehouse in three days, thus accelerating the refund process, the firm said. Customers can now expect to receive refunds on returned items in less than one week, down from about ten days with the prior shipping method. As part of its research methodology, StellaService makes multiple orders on the Online Apple Store each day and assumedly returns at least a portion of those items to track processing times. In its ongoing study, the firm also found incoming packages marked with the FedEx 2Day stamp. It is unclear when Apple began using the expedited service, but the change was first noticed last November. The improvement was first attributed to the tumultuous holiday shopping season which sees a massive amount of product returns. A person familiar with Apple's new procedure said the expedited shipping labels come at no extra cost to customers, suggesting the unadvertised move is another step in the company's bid for total customer satisfaction. 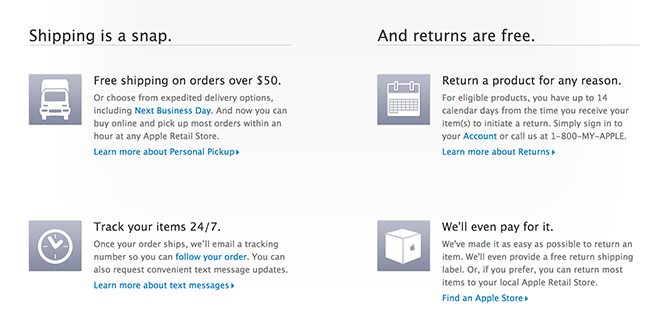 Apple has not commented on the change and specific shipping methods are not mentioned on the company's Returns and Refunds webpage.